Spotlight: New Orleans, Louisiana, U.S.A.
marks an event that is FO FREE!! Tea time is one of my favorite family traditions. Around Christmas, my Oma and Mom always set up an incredible spread of homemade cookies and treats. The historic Longue Vue House in New Orleans is offering their annual holiday tea December 3rd, 1-3pm, $45 a seat, and with such a beautiful location it’s bound to be a grand afternoon. Find more information here. Always oo’d and ahh’d at the outside of the historic homes in the French Quarter? Me too… Now’s your chance to see the equally beautiful interiors in all their holiday decorations with a self-guided walking tour! The homes are open from 1-4PM on Sunday, December 18th, and costs $20 per person. Proceeds benefit the community event, Caroling in Jackson Square, later that evening. Find more information on the event and tickets here. Decorated St. Charles home at State St.
information on the Crescent City Farmer’s Market here. Holiday caroling has taken place in the heart of the French Quarter at Jackson Square since 1946! The event is free and open to everyone, with song sheets provided. Gates open at 6:30pm so you can sing your little heart out the whole evening on Sunday, December 18th. Find more information here. The current special exhibit at the Louisiana State Museum’s Jazz Museum in Old U.S. Mint features vintage instruments- including Fats Domino’s piano. Definitely worth a visit to take a peek into the musical heritage so prevalent in the Big Easy. Celebration in the Oaks is one of my absolute favorite events in New Orleans! City Park’s oaks are so incredibly beautiful, and look extra incredible strung with twinkling lights. Spending an evening strolling through the lit up Botanical Gardens with good friends and a cup of cocoa is the perfect way to end the fall semester. I also highly recommend the little train ride- you may be with a ton of little children but it’s honestly too cute to pass up. Find more information via City Park here. 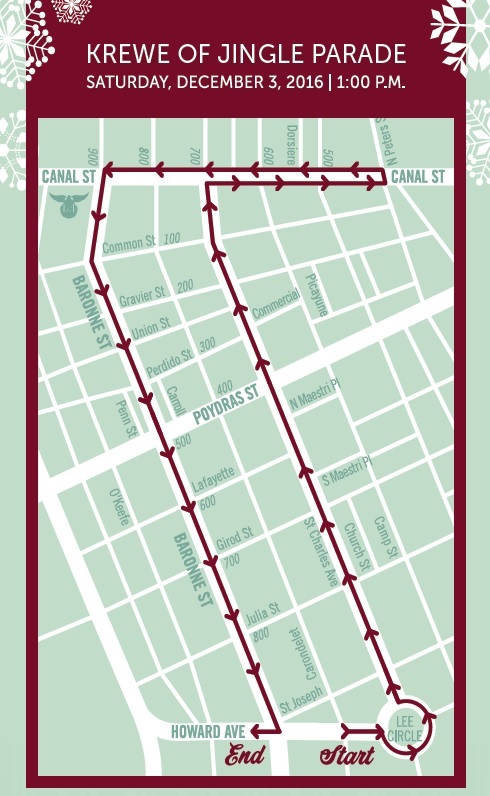 A perfect event for kiddos, a one-mile and half-mile race take place along Canal Street among all of the holiday decorations. Costumes are encouraged! Race takes place at 9am on December 10th. For more events hosted by Downtown New Orleans, check here. 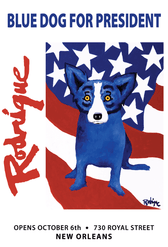 George Rodrigue’s famous Blue Dog was featured on this year’s “I voted” Louisiana stickers. (Still bitter I didn’t get one!) At the late Rodrigue’s gallery at 730 Royal Street, you can find an exhibit featuring Rodrigue’s portraits of American officials to celebrate the election. The exhibit runs until December 31st, and is a perfect jumping off point for a self-guided art walk on gallery-filled Royal Street. Every Friday night, New Orleans Museum of Art stays open late for artists talks and extra hours. Check out the museum’s calendar for specifics on the schedules for each Friday. SO EXCITED ABOUT THIS. The city of New Orleans offers free screenings along the river in the French Quarter, and is featuring holiday movies for December. On Friday, December 9th, the city will be showing Frozen at 6:30pm (eep! ), and Elf on December 16th. Grab some friends, some snacks, some drinks, and some blankets for probably the chillest night to ever be had in downtown New Orleans. Spirit Wines on Magazine offers a free wine tasting with cheese and charcuterie from 5-7pm. Make this your first stop on a crawl around Magazine and save yourself a nice chunk of change! Amy Schumer gif courtesy of giphy.com. New Orleans has a festival for EVER-Y-THING. Each December, PhotoNola celebrates photography throughout the city. This year, the festival will be December 8-11th, and will take place in multiple exhibitions across the city. Click here for more info. I love to gift local NOLA art to my family (and to myself)! The city is overflowing with talent, and we are so incredibly lucky to be able to participate in it, even if it’s just through purchases. Check out a holiday market extravaganza at the Ogden to find perfect gifts for everyone on your list. December 6th, 5-8pm, with more info here. Reveillon (Ree-vee-on) Dinners are a Creole tradition in New Orleans of eating a big family meal following Christmas mass. Today, many of New Orleans’ premiere restaurants offer multi-course set menu Reveillon dinners during the holiday season- starting at 35$ (which you know after living here is a steal for some places!). I’ve got my eye on Lüke’s turtle soup and braised short ribs as well as Upperline’s flexible menu with tons of classic New Orleans choices, but you can find a full list of participating restaurants here. The Jazz and Heritage Foundation’s is featuring a photo exhibit on the colorful and deep-rooted history of second-line parades in New Orleans at their Jazz and Heritage Gallery on Rampart Street. The exhibit is free but will only be on display until December 16th so be sure to go early in the month to educate yourself. For more info, check out their website! The Magazine Street Art Market takes place every Saturday and Sunday from noon-6pm in the courtyard of the Dat Dog on Magazine Street. This little market is the perfect size to keep one from feeling overwhelmed, and always features beautiful paintings, prints, jewelry, and knick knacks from local artists. Definitely a top spot to pick up a meaningful gift and support a local artist. Be sure to grab a gourmet hot dog while you’re at it- I personally love the Gator-dog, Hot Kenner Sausage, and Fried Chicken! Louisiana Philharmonic and the beloved 610 Stompers- what more could you want out of a holiday concert?? This holiday spectacular will be at the Orpheum Theater Saturday, December 12th, at 7:30pm, and Sunday, December 13th, at 2pm. Tickets start at $20 and the show program and details can be found here. Mickey Mouse gif courtesy of giphy.com. As a history major, military brat, and just all over fan of the World War II Museum, I couldn’t not include one of their exhibitions! This exhibit, ending January 1st, features 26 original and iconic pieces from LIFE magazine that Tom Lea created as a war correspondent and artist. Definitely more solemn than the other events on my list, but still a wonderful option for a rainy afternoon. Find more info on the exhibit and museum here. This year’s Nola Christmas Fest features over 70 Christmas trees decorated by local orgs. If you love Christmas trees as much as I do, this seals the deal. If not, maybe the plethora of inflatables, an indoor ice skating rink, and carnival rides will do the trick! The fest runs from December 16th-31st at the Convention Center with tickets starting at 15$. Find more information at the event’s website. This year’s Jingle Bell 5k to benefit the Arthritis Foundation will be Saturday, December 17th. For this run, dressing up in holiday costume and tying jingle bells to your tennis shoes is encouraged. If you’re feeling sluggish from all of your holiday season munchies, definitely join the run in Audubon Park for a good cause! Located along picturesque St. Charles Avenue, the Columns Hotel provides a perfect place to sit on a porch and sip on some holiday cocktails with friends while watching the streetcars pass by. Dress nicely to avoid the naughty list! For more holiday cocktails check out a comprehensive lists of all the special drinks being featured throughout the city! Throughout the month of December, the historic St. Louis Cathedral in the French Quarter is offering free holiday concerts culminating in the Cathedral’s Classical Christmas concert on December 18th. Whether jazz or gospel is your thing, check out this complete list of dates to feast your ears to some free holiday tunes in an incredible setting. Take an hour while downtown to peek in and out of some of New Orleans’ gorgeous hotels’ holiday decorations! Some of my favorites are The Roosevelt’s lobby and the lobby of The Monteleone. Make sure to grab a drink at The Monteleone’s famous carousel bar too! Free swing dancing lessons yes please! Sunday nights at 8pm at the Allways Lounge on St.Claude, these lessons are followed by a live jazz band from 9pm-midnight! A bit out of the city, but the Cajun tradition of lighting the way for Papa Noël (aka Santa Clause) with bonfires along the river stays strong in St. James Parish on Christmas Eve. For a closer event, check out the bonfires in Algiers on December 2nd. The House of Blues is offering an amazing concert with some of Nola’s most well-known musicians (like Trombone Shorty, Rebirth Brass Band, and Kermit Ruffins) to benefit NOCCA, the Louisiana Arts Conservancy. The concert takes place Thursday, December 22nd. Visit the zoo and get your winter fill of ice skating December 26-31st. Take this as a chance to visit the Zoo’s new African painted dog pups- so cute! Lit oaks along St. Charles Avenue. from 6-9pm every night and is definitely going to offer a unique and awesome time in the CBD. December 17th-18th the New Orleans Ballet will be performing the Nutcracker. Every Christmas, my parents always play the Nutcracker Suite throughout our house and now I find the holidays to be incomplete without it. Tickets start at 25$ and there are matinee and evening performances. The Arts Market of New Orleans is my absolute favorite art market in New Orleans. I love just wandering through the booths in Palmer Park and the art market is the perfect size. This December, the market will have two dates to provide extra opps for picking up some beautiful treasures. December 17th and 18th, 10am-4pm. Be sure to stop by and pet the Animal Rescue New Orleans dogs at their table! Wow. Can you believe that my picks are just a fraction of the events going on this December?? Check out even more events from New Orleans Online, and the Gambit Calendar! What are you looking forward to most in New Orleans this December? Let me know in the comments below!